Dong, C., Wu, Y., Gao, J., Zhou, Z., Mu, C., Ma, P., Chen, J. and Wu, J. (2018). 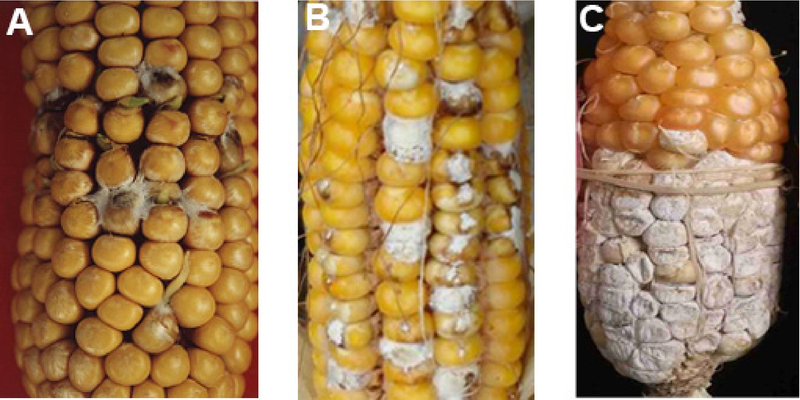 Field Inoculation and Classification of Maize Ear Rot Caused by Fusarium verticillioides. Bio-protocol 8(23): e3099. DOI: 10.21769/BioProtoc.3099. Maize ear rot is a worldwide fungal disease mainly caused by Fusarium verticillioides and Fusarium graminearum. Maize planted in the field was inoculated with Fusarium verticillioides at the filling stage, 15 days after pollination. Two milliliters of spore suspension with a concentration of 5 x 106/ml was injected into the middle of the top ear using pricking ear method to cause maize ear rot. The thirty days after inoculation was the most suitable time for phenotypic evaluation of Fusarium resistance. Maize ear rot is a fungus-induced ear disease that occurs widely in Europe, America, Africa, Asia and Oceania (Desjardins et al., 2000; Pamphile and Azevedo, 2002; Hussain et al., 2005; Anjorin et al., 2008; Görtz et al., 2008; Rahjoo et al., 2008; Dorn et al., 2009; Eckard et al., 2011; Scauflaire et al., 2011; Madania et al., 2013). In 1977, maize ear rot swept through the state of Meghalaya, India. In 1988, maize ear rot was prevalent in the USA, and became a key biological control factor in maize production of African, resulting in a 48% reduction in maize yield (Vigier et al., 2001). Moreover, the infected maize ears also produced mycotoxins such as fumonisin and deoxynivalenol, which seriously threatened human and animals’ health (Gelderblom et al., 1988; Wild and Turner, 2002; Zhou et al., 2010). At present, it is generally and internationally considered that Fusarium is the main pathogen causing ear rot in maize. However, different countries or different regions of the same country may have different types of pathogens, and the dominant pathogen may also be different in different regions. The dominant pathogen is Fusarium graminearum in the USA, Austria and Germany (Schaafsma et al., 1997; Goertz et al., 2010; Mesterházy et al., 2012), but Fusarium verticillioides in France, South Africa, Croatia, Iran, Argentina, Brazil and China (Presello et al., 2004; Aliakbari et al., 2007; Ivić et al., 2008; Folcher et al., 2010; Small et al., 2012; Stumpf et al., 2013; Qin et al., 2014). No matter what the pathogen is, it is very important to have an effective artificial inoculating method in order to get the accuracy resistance evaluation. To date, a total of four inoculation methods were reported in publications, silk channel injection method, silk spray method, prick ear method and toothpick method. A large number of maize germplasms with resistance to maize ear rot were screened by prick ear method and the genetic basis of the resistance were elucidated in our previous study (Chen et al., 2002; Dong et al., 2006; Li et al., 2008; Sun, 2009; Chen, 2012; Li, 2012; Wang et al., 2016). 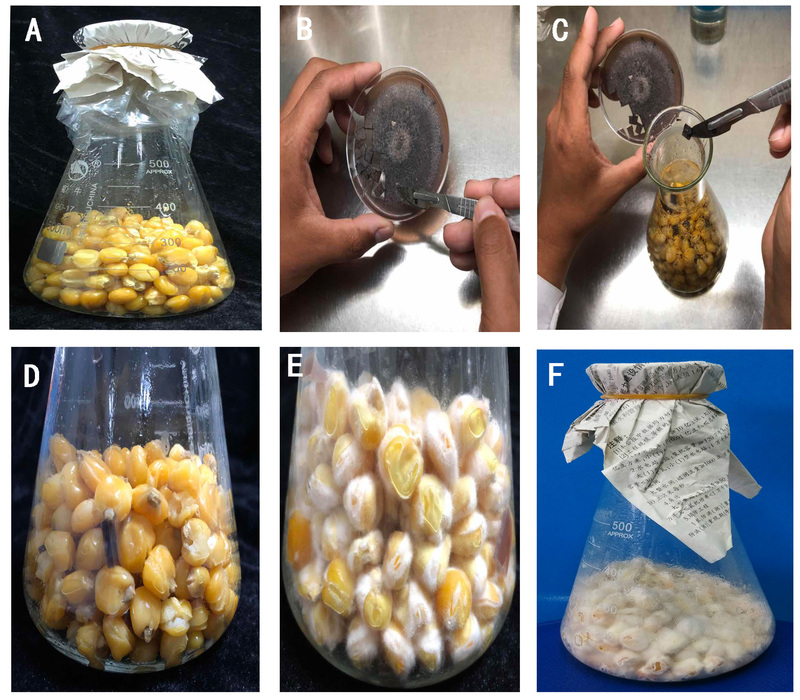 This method that can easily control the inoculation dose together with the suitable inoculation time can accurately reflect the underlying resistance in the maize materials. The melted PDA is cooled to about 60 °C after sterilization under 121 °C high-temperature steam for half an hour, and then poured into each Petri dish for about 18-20 ml until completely set. Use flame to disinfect the scalpel, and pick a bit of cold stored Fusarium verticillioides onto the plates. Repeat this step for a few other plates. Use parafilm to seal the plates and keep them in the dark at 28 °C for 5 to 7 days. Cut off a block of 1 cm2 from the edge of the PDA plate full of Fusarium verticillioides cultured in Step A2 above with a flame-disinfected scalpel, and put it on a new PDA plate for culture. Repeat this step until enough plates meet your needs. Then culture these plates at the same condition in Step A2 above. When the PDA plates were filled with Fusarium verticillioides after 5 to 7 days, keep them in 4 °C refrigerator for use. Prepare 1,000 g newly harvested maize hybrid seeds without impurities, mildew and moth damage. Wash the seeds with tap water for 2-3 times, then use distilled water wash 1 time again to remove the remaining tap water. Add 3 L distilled water to the seed samples, and boil about 2 h or more time until the seeds just crack and the water content is moderate. The proper boiling time can avoid the grain rupture seriously and high moisture content which is not conducive to the growth of Fusarium verticillioides. Remove the remaining water from the boiled maize seeds. And then fill boiled seeds in 500 ml conical flasks to the 200 ml line, and take this as a standard. Normally, 1,000 g seeds can make 10 conical flasks with around 200 ml boiled maize seeds. Use two-layer aseptic breathable seal membrane or one-layer aseptic breathable seal membrane plus two-layer newspaper to seal the conical flasks with rubber band. Sterilize the conical flasks with seeds in a high-pressure steam sterilizer at 121 °C for 30 min. Then, keep them at room temperature for 48 h to ensure no microbial contamination (Figure 1A). Figure 1. Operation procedure of Fusarium verticillioides propagation on maize medium. A. The maize seeds after sterilization. B. Cut the PDA culture medium with newly cultured Fusarium verticillioides into small pieces. C. Put three pieces into a conical flask. D. The maize culture medium after fully mixing. E. Fusarium verticillioides grow for 3 days on maize medium. F. Fusarium verticillioides grow for 8 days on maize medium. In the super clean bench, put three pieces of 1 cm2 PDA medium with newly cultured Fusarium verticillioides in the conical flask and shake fully (Figures 1B-1D). Of course, you can also put more than three pieces for faster propagation. Then, culture them in a constant temperature incubator of 28 °C in the dark. Generally, the best harvest time is on the 7th-10th day because of the large number of spores and strong spore activity (Figures 1E and 1F). Note: With time going on, the number of spores does not increase, and some spores begin to deform. So it is best to harvest them in 10 days. One day before inoculation, open the conical flask filled with hypha, stir gently in one direction after add 200 ml sterilized water, then filter through eight layers of gauze into a 2,000 ml beaker. Normally, after repeat it three or four times, the most of spores could be washed off. Dilute the spore suspension above and mix well, then count the number of spores using a hemacytometer under a microscope. Ensure the final concentration of spore suspension is 5 x 106/ml. At last, add 2 μl Tween-80 in per ml spore suspension, mix evenly and stay at 4 °C for use. Generally, the spores in each conical flask can be made into 5 L working solution. Note: Once the working solution is prepared, use it as soon as possible, because we found that the concentration would change after two days in 4 °C refrigerator. You need to recalculate the number of spore in the working solution before use it after a long time. Plant about 4 rows of border maize around the inoculation test field to ensure that the growth of the inoculation test materials is uniform. Set 2-3 replications to reduce the experimental errors. It is very important to control the pests, such as corn borers, especially. According to our study, the best inoculation period is at milk stage, around 15 days after pollination. At this time, the husk looks still green and the silk has just become brown and dry (Figure 2A). The kernels are full of milky liquid and look big and plump with the water content of about 60% (Figure 2B). So it is very easy to perform inoculation and suitable for growth of Fusarium verticillioides. Neither earlier nor later inoculation is helpful to inoculation and phenotypic evaluation. If earlier, the kernels are too little to carry out inoculation, and the whole ear will be faced with earlier death because of infection of Fusarium verticillioides. If later, the kernels become too hard to penetrate, and the fungus will not develop well because of lack of enough water in kernels. So the epidemic area of the ear is too small to reveal the difference of resistance to maize ear rot. In practice, it is very important to pay much attention to the growth stage of different maize materials. Figure 2. The 17-day-old ear of inbred line N6 after pollination. A. The husk and silk of the ear. B. The appearance of kernels. We usually perform the inoculation at 6:30-10:00 and 16:00-18:30 to avoid the high temperature to affect the efficiency of inoculation. The optimum dose, 2 ml, need to be injected into the middle of the ear at two times, 1 ml for one time, to make two inoculating holes that are 1 cm apart. Because the kernels in the middle are often plump and two inoculation holes can increase the success rate of inoculation. It’s better to put the needle into the seeds than between the seeds, since it can increase the rate of successful inoculation. When inoculating, you should limit the extension of the needle to less than 90 degrees at the ear in order to reduce the out-flow of the spore suspension from the inoculating hole (Figure 3A). At last, seal the inoculation point with a piece of paper adhesive tape (Figure 3B). Note: For the beginners, it is very necessary to practice a few times before inoculate the experiment in order to reduce experimental error caused by operation. Figure 3. Inoculation method in the field. A. The syringe needle penetrates into the kernel but not into the cob. B. Seal the inoculation point with paper adhesive tape. The phenotypic evaluation is conducted at the maturity stage. Generally speaking, after 3 days of inoculation, the color around the wound will turn to brown and there will be sparse white mycelium around the wound. At this time, there will also be thin white mycelium on the surface of the kernels near the wound and the space between kernel rows. The infected kernels begin to become yellowish-brow at the top, the junction of the silk and kernel. With time going on, the infected area will expand and the infected kernels gradually turned brown until rot. On the 20th day after inoculation, the diseased grains appear in the softening, which is typical symptom of maize ear rot. The hyphae start to spread slowly after twenty days of inoculation, so the infection areas almost keep stable until maturity. We find at least 3 types of symptoms caused by Fusarium verticillioides, as summarized below (Sun, 2009), and the resistance evaluation of germplasm resources according to the infected area (the percentage of infected kernels in the whole ear). Kernel rotten with germination. For example, the seed of maize line 177 under the higher humidity environment will germinate, and there are white mycelium around the germinated seeds in serious condition (Figure 4A). Kernel rotten within limited area, such as Yu 374 (Figure 4B). Kernel rotten within large area, such as inbred line N6 (Figure 4C). Figure 4. Different ear rot symptoms on different maize inbred lines. A. Maize line 177. B. Yu 374. C. Inbred line N6. Maize ear rot is classified into seven grades according to the infected area (the percentage of infected kernels in the whole ear) (Table 1). Generally, in order to minimize the error, two experienced researchers are enough to carry out the phenotypic evaluation. It is very difficult to finish the large-scale evaluation of maize ear rot in a short time. So, you can harvest them with husk. Dry the ear with husk in the sun for 2-3 days; then phenotypic evaluation can be conducted. If without husk, it is very easy to result in kernel loss because of dry ear. However, it's better to evaluate the phenotype as soon as possible to minimize the experimental error. In addition, you can organize labor to peel off the husk in the field and break the upper stem of the ear, leaving only ears for evaluation. 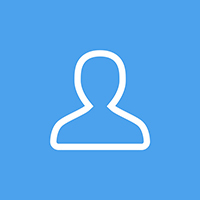 According to the evaluation of plot area, select a number of evaluators to evaluate. An experienced evaluator can evaluate around 0.1 hectare of inoculated field within 8 h. Note that the selection of evaluators should be consistent with the assessment criteria, and the rank of the same material should be consistent as far as possible. Generally, we record both the percentage of infected kernels in the whole ear and the grade at the same time. The method of analysis will depend on the experimental design. In order to better assess the disease grades, seed setting rate of the materials should be evaluated according to the 1-3 grades at the same time. During your later statistical calculation, you can effectively eliminate the abnormal value caused by the lack of full fruiting. Grade 1 of the seed setting rate indicates that full grain occupies more than 75% of panicle area, and grade 2 indicates that full grain occupies 50%-75% of panicle area. Grade 3 means full grain occupies less than 50% of panicle area. In genetic research and breeding, in order to reduce the error of the evaluation of maize ear rot caused by fructifying, you can collect the pollen of other maize plants to increase the seed setting rate by artificial assistant pollination. Our study shows that individual material may have Xenia effect caused by artificial supplementary pollination, but the pollen of other materials has no effect on the contemporary grain resistance to maize ear rot. This project was funded by the National Natural Science Foundation of China (NSFC) (Grant No. 31761143009) and Key Scientific Research Projects of Henan Colleges and Universities (Grant No. 18A180014). We are grateful to the graduate students in our team for their efforts on the maize ear rot related research. The author states that there is no conflict of interest or competing interest. Aliakbari, F., Mirabolfathy, M., Emami, M. and Mazhar, S. F. (2007). Natural occurrence of Fusarium species in maize kernels at gholestan province in northern Iran. Asian J Plant Sci 6(8): 1276-1281. Anjorin, S., Makun, H., Adesina, T., and Kudu, I. (2008). Effects of Fusarium verticilloides, its metabolites and neem leaf extract on germination and vigour indices of maize (Zea mays L.). Afr J Biotechnol 7(14): 2402-2406. Desjardins, A. E., Manandhar, G., Plattner, R. D., Maragos, C. M., Shrestha, K. and McCormick, S. P. (2000). Occurrence of Fusarium species and mycotoxins in nepalese maize and wheat and the effect of traditional processing methods on mycotoxin levels. J Agric Food Chem 48(4): 1377-1383. Dorn, B., Forrer, H.-R., Schürch, S. and Vogelgsang, S. (2009). Fusarium species complex on maize in Switzerland: occurrence, prevalence, impact and mycotoxins in commercial hybrids under natural infection. Eur J Plant Pathol 125(1): 51-61. Eckard, S., Wettstein, F. E., Forrer, H. R. and Vogelgsang, S. (2011). Incidence of Fusarium species and mycotoxins in silage maize. Toxins (Basel) 3(8): 949-967. Folcher, L., Delos, M., Marengue, E., Jarry, M., Weissenberger, A., Eychenne, N. and Regnault-Roger, C. (2010). Lower mycotoxin levels in Bt maize grain. Agron Sustain Dev 30(4): 711-719. Gelderblom, W. C., Jaskiewicz, K., Marasas, W. F., Thiel, P. G., Horak, R. M., Vleggaar, R. and Kriek, N. P. (1988). Fumonisins--novel mycotoxins with cancer-promoting activity produced by Fusarium moniliforme. Appl Environ Microbiol 54(7): 1806-1811. Goertz, A., Zuehlke, S., Spiteller, M., Steiner, U., Dehne, H. W., Waalwijk, C., de Vries, I. and Oerke, E. C. (2010). Fusarium species and mycotoxin profiles on commercial maize hybrids in Germany. Eur J Plant Pathol 128(1): 101-111. Görtz, A., Oerke, E. C., Steiner, U., Waalwijk, C., Vries, I. and Dehne, H. W. (2008). Biodiversity of Fusarium species causing ear rot of maize in Germany. Cereal Res Commun 36(Supplement 6): 617-622. Hussain, S. M., Hess, K. L., Gearhart, J. M., Geiss, K. T. and Schlager, J. J. (2005). In vitro toxicity of nanoparticles in BRL 3A rat liver cells. Toxicol In Vitro 19(7): 975-983. Ivić, D., Čabrić, M., Palaveršić, B. and Cvjetković, B. (2008). 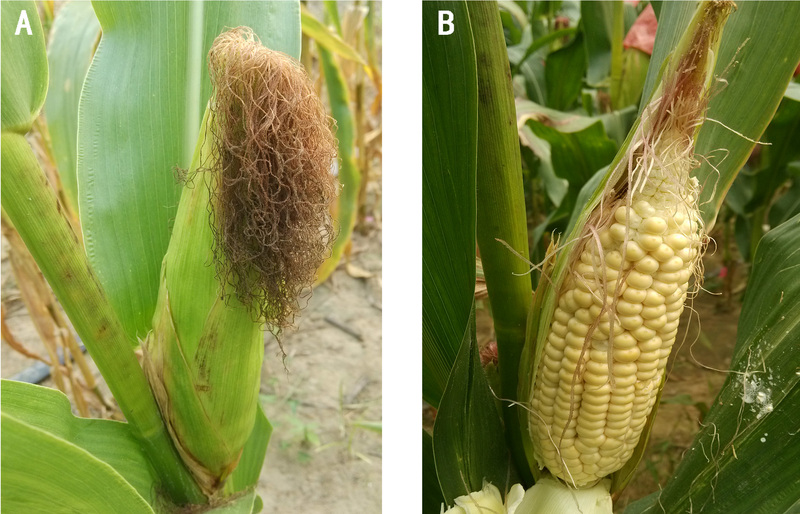 No correlation between pericarp thickness and Fusarium ear rot (Fusarium verticillioides) in croatian maize hybrids and lines. Maydica 53(1): 297-301. Madania, A., Altawil, M., Naffaa, W., Volker, P. H. and Hawat, M. (2013). Morphological and molecular characterization of Fusarium isolated from maize in Syria. J Phytopathol 161(7-8): 452-458. Mesterházy, Á., Lemmens, M. and Reid, L. M. (2012). Breeding for resistance to ear rots caused by Fusarium spp. in maize – a review. Plant Breeding 131(1): 1-19. Pamphile, J. A. and Azevedo, J. L. (2002). Molecular characterization of endophytic strains of Fusarium verticillioides (= Fusarium moniliforme) from maize (Zea mays. L). World J Microb Biot 18(5): 391-396. Presello, D. A., Reid, L. M. and Mather, D. E. (2004). 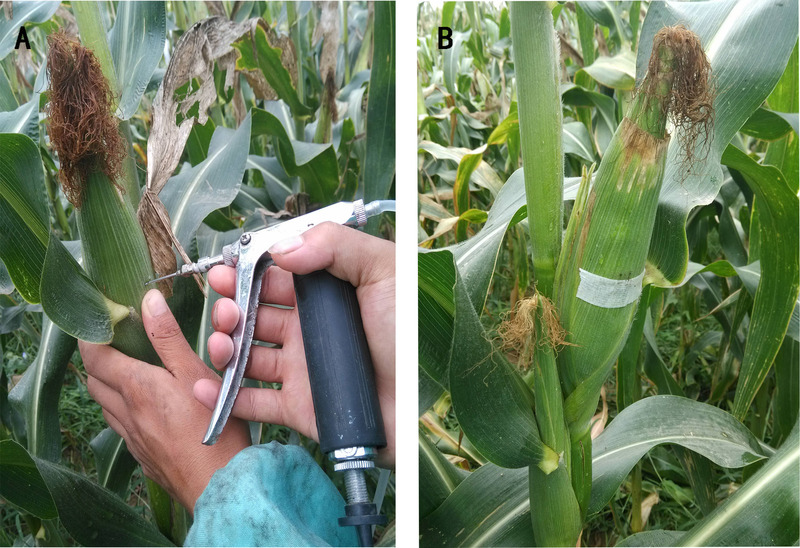 Resistance of argentine maize germplasm to Gibberella and Fusarium ear rots. Maydica 49(49): 73-81. Rahjoo, V., Zad, J., Javan-Nikkhah, M., Gohari, A. M., Okhovvat, S. M., Bihamta, M. R., Razzaghian, J. and Klemsdal, S. S. (2008). Morphological and molecular identification of Fusarium isolated from maize ears in Iran. J Plant Pathol 90(3): 463-468. Scauflaire, J., Mahieu, O., Louvieaux, J., Foucart, G., Renard, F. and Munaut, F. (2011). Biodiversity of Fusarium species in ears and stalks of maize plants in Belgium. Eur J Plant Pathol 131(1): 59. Schaafsma, A. W., Nicol, R. W. and Reid, L. M. (1997). Evaluating commercial maize hybrids for resistance to gibberella ear rot. Eur J Plant Pathol 103(8): 737-746. Small, I. M., Flett, B. C., Marasas, W. F. O., McLeod, A., Stander, M. A. and Viljoen, A. (2012). Resistance in maize inbred lines to Fusarium verticillioides and Fumonisin accumulation in South Africa. Plant Disease 96(6): 881-888. Stumpf, R., Santos, J. d., Gomes, L. B., Silva, C. N., Tessmann, D. J., Ferreira, F. D., Machinski Junior, M. and Del Ponte, E. M. (2013). Fusarium species and fumonisins associated with maize kernels produced in Rio Grande do Sul State for the 2008/09 and 2009/10 growing seasons. Braz Jo Microbiol 44: 89-95. Vigier, B., Reid, L. M., Dwyer, L. M., Stewart, D. W., Sinha, R. C., Arnason, J. T. and Butler, G. (2001). Maize resistance to gibberella ear rot: symptoms, deoxynivalenol, and yield1. Can J Plant Pathol 23(1): 99-105. Wang, Y., Zhou, Z., Gao, J., Wu, Y., Xia, Z., Zhang, H. and Wu, J. (2016). The Mechanisms of maize resistance to Fusarium verticillioides by comprehensive analysis of RNA-seq data. Front Plant Sci 7: 1654. Wild, C. P. and Turner, P. C. (2002). The toxicology of aflatoxins as a basis for public health decisions. Mutagenesis 17(6): 471-481. Zhou, X., Heyer, C., Choi, Y.-E., Mehrabi, R. and Xu, J.-R. (2010). The CID1 cyclin C-like gene is important for plant infection in Fusarium graminearum. Fungal Gene Biol 47(2): 143-151. How to cite: Dong, C., Wu, Y., Gao, J., Zhou, Z., Mu, C., Ma, P., Chen, J. and Wu, J. (2018). Field Inoculation and Classification of Maize Ear Rot Caused by Fusarium verticillioides. Bio-protocol 8(23): e3099. DOI: 10.21769/BioProtoc.3099.